Jean-Baptiste Say (January 5, 1767 – November 15, 1832) was a French economist and businessman. He had classically liberal views and argued in favor of competition, free trade, and lifting restraints on business. His most significant contribution is the thesis, known as "Say's Law," that supply creates its own demand. Thus he supported the laissez-faire position of Adam Smith, stating that overproduction in one market will naturally return to balance without government interference as the producer will either adjust production to different items or adjust prices until the goods sell. Say did not, however, agree with Smith's labor theory of value that the value of a commodity depends on the labor involved in its production, arguing instead that value derives from its ability to satisfy the desires or needs of the consumer. 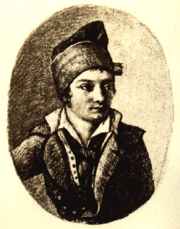 Jean-Baptiste Say was born in Lyons, France on January 5, 1767 to a family of textile merchants of Huguenot extraction. In 1787, after spending two years in England apprenticed to a merchant, Say took a job at an insurance company in Paris run by Clavière (later to become Minister of Finance). In 1793, Say married Mlle Deloche, daughter of a former lawyer. It was around this time that Say read Adam Smith's book and fell in with a group of laissez-faire economists, known as the ideologues who sought to relaunch the spirit of Enlightenment liberalism in republican France. Indeed, Say was the first editor of La Decade Philosophique, a journal published by the group. Say's eminence grew such that he was nominated to the Tribunate in 1799, sitting in the finance section. The radical laissez-faire notions expounded in Say's 1803 Treatise caught the attention of Napoleon Bonaparte himself, who demanded that Say rewrite parts of the Treatise to conform with Bonaparte’s views—Say refused. Consequently, Napoleon proscribed the Treatise and had Say ousted from the Tribunate in 1804. He then turned to industrial pursuits, and, having made himself acquainted with the processes of the cotton manufacture, founded a spinning-mill which employed four or five hundred persons, principally women and children. He devoted his leisure to the improvement of his economic treatise, which had for some time been out of print, but which the censorship did not permit him to republish. In 1814, he "availed himself" (to use his own words) of the sort of liberty arising from the entrance of the allied powers into France to bring out a second edition of the work, dedicated to the emperor Alexander I of Russia, who had professed himself his pupil. In the same year, the French government sent him to study the economic condition of the United Kingdom. The results of his observations appeared in A tract de l'Angleterre et des Anglais (1815). The Bourbon restoration government showered Say with numerous dignities and honors. In 1816, he was invited to deliver a course of lectures on economics at l'Athénée Royale, a private college. In 1819, he was appointed to the Chair of Industrial Economy at the Conservatoire National des Arts et Metiers. His popular lectures were published in 1828. In 1831, Say was granted a chair (the first in economics) at the prestigious Collège de France. Jean-Baptiste Say died in Paris in 1832. In 1803, Say published his most famous work, Treatise on Political Economy. His distinctive approach to economics was the outcome of a muddled marriage of Condillac’s utility theory of demand and Adam Smith's cost theory of supply. Value, Say claimed, was the outcome of the interaction of these two. In this respect, he departs considerably from the Classical Ricardian School, where value is determined purely from the cost side. Say's approach was taken up by French Liberal School and he can be considered a precursor of the Marginalist Revolution. Like Richard Cantillon before him and the Austrian School after him, Say also placed great emphasis on the risk-taking entrepreneur and even tried to include him as the "fourth" factor of production in his analysis. Say brought the entrepreneur to life and to the center of the stage. But what do these entrepreneurs do? They use their "industry" (a term Say prefered to "labor") to organize and direct the factors of production so as to achieve the "satisfaction of human wants." But they are not merely managers. They are forecasters, project appraisers, and risk-takers as well. Out of their own financial capital, or that borrowed from someone else, they advance funds to the owners of labor, natural resources ("land"), and machinery ("tools") (Say 1803). For Say, the foundation of value is utility, or the capacity of a good or service to satisfy some human desire. Those desires and the preferences, expectations, and customs that lie behind them must be taken as givens, as data, by the analyst. The task is to reason from those data. Say is most emphatic in denying the claims of Adam Smith, David Ricardo, and others that the basis for value is labor, or "productive agency" (Say 1803). In this, he anticipated the Austrian School's subjective theory of value. The nature of the products is always regulated by the wants of society... [ therefore] legislative interference is superfluous altogether (Say 1803, 144). It was also in the Treatise that Say outlined his famous "Law of Markets" (also known as "Say's Law"). Roughly stated, Say's Law claims that total demand in an economy cannot exceed or fall below total supply in that economy or as James Mill was to restate it, "supply creates its own demand." In Say's language, "products are paid for with products" (Say 1803,153) or "a glut can take place only when there are too many means of production applied to one kind of product and not enough to another" (Say 1803, 178-179). Say's law says “the supply (sale) of X creates the demand (purchase) of Y.” This law can be shown by business-cycle statistics. When downturns start, production is always first to decline, ahead of demand. When the economy recovers, production recovers ahead of demand. As an illustration, let us look at an historical event. Herbert Hoover and Franklin Delano Roosevelt thought that people simply did not have enough money to buy the output of industry. In a sense that was true, but the program that such a theory evidently called for—raising wages and protecting jobs, which would presumably give people the extra money needed to buy more industrial production—had disastrous results: Unemployment hovered around 20 percent for a decade, despite the best efforts of the New Deal. Generally, public policies in the post-World War II world, including everything from protective tariffs and "fair trade" to unionism and the minimum wage, are based on the principle of "how to achieve sufficient demand to absorb available production." These kinds of ideas are usually identified with John Maynard Keynes, whose biographer, Robert Skidelsky (1996), noted that Keynes' "aim was simply to ensure a level of aggregate demand sufficient to enable market-clearing real wages to be established without price inflation." But Hoover, Roosevelt, and Keynes seemed to miscalculate a bit there, ignoring "Say's Law," that suggested "supply creates demand" (Sowel 1972). From Say's Law it can be understood that if inventory doesn't sell, then prices will be cut until it does. Or, if a manufacturer wants to sell to a mass market, he knows that he cannot wait until everyone can afford something expensive; he knows that he has to market his product at a low enough price that it will begin to sell. When industrial production increases and more goods become available, some old goods will go unsold as money moves over to the new goods, and prices will have to fall right across the board. That is called "deflation," and it is what happened in the United States from the end of the Civil War until 1896, while the United States grew to have the largest economy in the world. Money became more valuable, and wages continued to buy as much as was desired of total production. Hence, the reason why there has been no deflation since World War II, even though the U.S. economy has grown vastly since then, was that deflation will only happen if the money supply does not grow fast enough as production increases. Prices will remain stable or even increase (inflation) if the money supply grows as fast or faster than production. If the money supply does not increase, the "wage and price spiral" runs out of money. If a business raises prices to offset wage increases, less of its production will be sold. If enough is sold that revenue actually increases, as desired, this will have two effects: (1) people are getting less for their money from this business, which decreases the value going to consumers; and (2) money is drawn from elsewhere in the economy, which means that there is less money left to buy the production of other businesses. Somebody gets the short end of the stick. Somebody has to cut prices. Then there is this “real wages” vs. “nominal wages” paradox. Wages that are not allowed to naturally seek a market clearing level will produce the same results as any other kind of price fixing scheme: when wages (prices) are too low, a shortage results; and when wages (prices) are too high, a surplus results. A surplus in the labor market is called "unemployment." Hoover and Roosevelt thus engineered, not greater demand and prosperity, but greater unemployment and unchecked depression (Sowel 1972). Another way to understand the concept of “real wages” is to note that what wages will buy depends on the value of money, while the value of money depends on the transactions the money supply must cover, in other words the output of the economy. Thus, what wages will buy depends on what the economy produces, and Say's Law means that the value of money will rise to a market clearing level, that is, until production may be purchased by the money held by consumers. The magic question here, with cutting prices in the deflation of a growing economy but inability to cut wages to the same degree, is this what is going to restore the profit margin? The answer according to Say is “greater productivity.” If the workers with higher real wages produce proportionally more for those wages, then the balance of revenue and expenses will be restored (Say 1803). Therefore, once Say's Law is understood, it is obvious that growth in production takes care of demand, as long as wages are allowed to maintain market-clearing levels. What happens to the money supply is secondary, though it helps to avoid falling wages, since people are not going to like that, whether it really makes any difference or not (and it will increase the value of debt). Price deflation is acceptable as long as wages do not also fall, but that is a tough target to hit. Growth in productivity, not just growth in production, is ultimately what makes life better and increases wealth for everyone. Jean-Baptiste Say has much to offer any reader, whether an economist or not. He saw many important truths with clarity, and wrote about them with passion and lucidity. Say once called economics "this beautiful, and above all, useful science." (Say 1803, 450). He left economics both more beautiful and more useful than he had found it. The paradox of Say's Law is thus that capital, the "supply side," is the only real means of improving the human condition—both the capital to create new production and the capital to create greater productivity—while "social" spending or regulation to artificially promote demand through high wages, the "demand side," can easily produce, or perpetuate, widespread poverty and misery. As the Soviet Union and the Marxian-based economic system reproduced the economic poverty as well as the political privilege of a medieval state, the New Deal, and the Keynesian rejection of Say's Law may have deeply affected and even distorted American politics and economic thought for years to come. Say was also among the first to argue that money was neutral in its effect on the economy. Money is not desired for its own sake, but for what it can purchase. An increase in the amount of money in circulation would increase the price of other goods in terms of money (causing inflation), but would not change the relative prices of goods or the quantity produced. This idea is found in the quantity theory of money, which received renewed attention in Milton Friedman's post-Keynesian formulation. As an interesting conjecture, Say's Law could be culled from the Bible—"As goods increase, so do those who consume them. And what benefit are they to the owner except to feast his eyes on them?" (Ecclesiastes 5:10) And in biblical simplicity we should recognize Say by his fruits: “supply side policies,” whereby supply creates its own demand (given the preconditions are fulfilled). As one could formulate it today, Say asks for a constitution and policy for stable money to prevent distortions of the mechanism of relative prices. He asks for security of private property, free prices, and competition on open markets as sustainable incentives for entrepreneurs to discover better solutions to new and old problems, to signal entrepreneurs correctly what people demand: what to produce, how, where, and when. And Say asks for low taxes and balanced budgets to finance the necessary legal and institutional framework of the market economy, always leaving citizens and their children enough of the fruits of their industry. Today we would add: to live a life in freedom and self-responsibility. Say, Jean-Baptiste. 1971. A Treatise on Political Economy: or the Production, Distribution and Consumption of Wealth. New York: Augustus M. Kelley. Say, Jean-Baptiste. 1815. De l'Angleterre et des Anglais. Say, Jean-Baptiste. 1817. Petit volume contenant quelques aperçus des hommes et de la société. Say, Jean-Baptiste. 1818. Des canaux de navigation dans l'état actuel de la France. Say, Jean-Baptiste. 1824. "Sur la balance des consommations avec les productions" in Revue Encyclopédique. Say, Jean-Baptiste. 1825. "Examen Critique du discours de M. MacCulloch sur l'économie politique" in Revue Encyclopédique. Say, Jean-Baptiste. 1826. "De la crise commerciale" in Revue Encyclopédique. Say, Jean-Baptiste. 1826. "De l'économie politique moderne, esquisse générale de cette science, de sa nomenclature, de son histoire et de sa bibliographie" in Encylopédie progressive. Say, Jean-Baptiste. 1827. "Compte rendu de Malthus: Definitions in Political Economy" in Revue Encyclopédique. Say, Jean Baptiste. 1828-1829. Cours complet d´economie politique pratique. Paris. ↑ The Pamphleteer (Letters to Thomas Robert Malthus on Political Economy and Stagnation of Commerce), McMaster University. Retrieved May 25, 2007. Palmer, R.R. 1997. J.B. Say: An Economist in Troubled Times. Princeton, NJ: Princeton University Press. All links retrieved April 9, 2018. This page was last modified on 9 April 2018, at 17:33.